“International Peace Initiative” (IPI) is our international project, in Meru, Kenya. 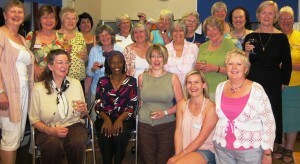 Dr Karambu Ringera is the founder of IPI – she is pictured at the top and bottom of this page with Club Members on visits to the UK. In the first she is pictured with the jewellery the Club sells, made by HIV+ve women in Kenya which provides them with a sustainable income (see picture of women with jewellery below). When Karambu visits it is wonderful to hear first hand how the money raised by the Club is being spent to eduate and empower women and girls whose lives have been affected by HIV and AIDS. See these video on Youtube: Dr. Karambu Ringera Talks About International Peace Initiatives (IPI) and Dr. Karambu Ringera talking about jewellery & Soroptimist project and you will find links to other videos from Karambu on these pages. Over the years of this partnership, Dr Karambu Ringera has told us inspirational stories from the Amani children’s home, that she has built with help from outside organisations including some in the UK and USA. Amani means peace in Swahili, and the home is a peaceful place where there are currently 27 children living to carry on their studies (see the picture left of the children playing). The transformation of the barren rocky wasteland to the lush gardens and organic market garden is amazing. Karambu’s aim is to create a self-sufficent children’s home where produce is grown on site along with some farm animals. The St Albans Soroptimist Club has fundraised to put 4 girls through secondary education at boarding schools. Lizabeth is pictured below ho lding a child she is looking after, with her brother Vincent and their mother. Susan and Caroline are pictured at the gates of the Amani Children’s home – and also below in more recent photos – along with letters they have written thanking the Club.